Strange goings-on in Russia… again. 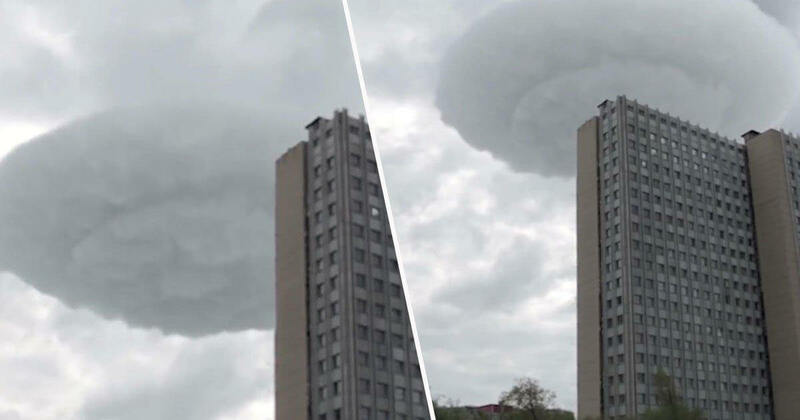 A cloud has been spotted above a block of flats in the Russian capital city Moscow. This isn’t just any cloud though, it’s like something out of Independence Day, but less Hollywood looking and more, well, just kinda grey looking. Still, it’s pretty perturbing to see. A definite flying saucer shape, and definite movement up and away to get out of there, and who’s to blame them. The unusual sight, which some sceptics are calling a mere weather phenomenon, was filmed by by an eyewitness who spotted the cloud over the city’s Adropov Avenue. What is that? Aliens? Is it a UFO? If it is aliens, you’re a bit late guys, the World Cup was last month, but we forgive you for your tardiness after what must have been a long journey. Now, some people might try to tell you this is just an unusually-shaped cumulus cloud – a particularly fluffy cloud at a particularly low level. Others might try to tell you it’s a lenticular cloud, which form when air travels along the surface of the Earth and encounter an obstruction like, for example, hills, mountains, or even a tower block of flats. But don’t let that put you off, young believers. If you think it’s a UFO, who’s to tell you otherwise? Be bold and mighty forces will come to your aid in the form of creatures from outer space. Goethe said that. Eastern Europe seems to be getting more than its fair share of UFO sightings lately. Earlier this summer, back in the heady days when we were all lost in a football haze, two glowing orbs were reportedly seen lighting up the midnight sky over the west of Kazakhstan, just a few miles from where England were playing Sweden in the World Cup quarter final. The collision then happened near the village of Bostandyk, around 1,000ft from the Zhalpakatal-Karasi highway, according to police. The unidentified flying object apparently ‘exploded’ on landing, causing houses in the area to ‘tremble’ while it also ignited a blaze on the land, wiping out bushes and grass over a 100 hectare area. According to locals, mobile communications were cut out due to the incident, and residents who rushed towards the site of the crash found a silver-coloured object partially buried in the ground, and another similar but smaller object nearby. The silver object had a sealed hatch with a protruding valve, which the locals were unable to open. While a law enforcement source said the strange object was like ‘a ball that had been welded shut’. Residents also reported seeing the object spinning in the sky before it crashed, with bright lights pulsating around it, the Mirror reports. I’ve no idea why, but once these aliens are seen they don’t seem to hang around long do they? Is Earth just way more disappointing than they were expecting?